The proper planting depth for spring-flowering bulbs is important for overall plant health as well as ensuring the bulbs will bloom. Different types of flowering bulbs need to be planted at different depths, but a good general rule of thumb is to plant the bulb at three times the height of the bulb. So, for example, if your bulb is 2 inches tall, you'd plant it 6 inches deep. Another general rule is that large bulbs should be about 8 inches deep, while smaller bulbs should be about 5 inches deep. Where you plant bulbs is equally as important as how deep they are planted. 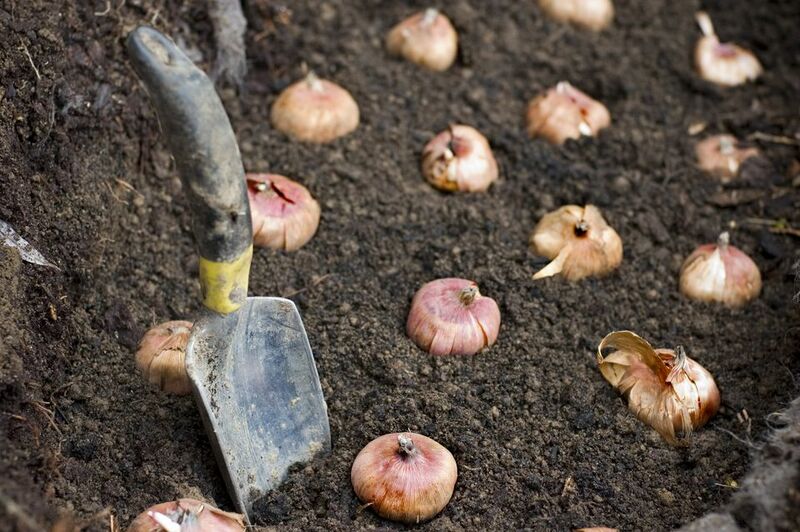 Most bulbs do best in well-drained soil in an area that gets at least six hours of full sun daily. Which side of the bulb should go up? The pointy side, as a general rule of thumb. If the bulb has sprouts but no point, the sprouting side goes up. Bulbs that have no discernible "up" side, such as poppy anemones, usually can be planted in any direction and the sprouts will find their way to daylight. Top the area where you plant the bulb with 2 to 3 inches of mulch, which helps to retain soil moisture and inhibit weeds. Don't forget to water the bulbs. It will help them get off to the best start possible and to develop properly. If the bulbs are at risk for being disrupted or eaten by critters, you may want to put some chicken wire on top of the ground and weight it down. You can remove the chicken wire once the bulb begins to sprout. Bulbs can be planted in containers as well as the ground. Just make sure the container has the appropriate diameter based on the bulbs' growing instructions. You can layer bulbs to create more color and dimension in your garden. For a distinctive look, plant smaller perennials, such as crocus or scilla, over larger bulbs, like daffodils, lilies, and tulips.